The "Rainbow Bridge" is an ancient legend from the tribes of the Indians of America and is aimed to all those people who suffer from the loss of their 4-legged friend and to all the animals on earth. The legend tells us that when our beautiful creatures say goodbye to us, they cross the Rainbow Bridge.... so called because it is a passage where animals are waiting to rejoin their beloved humans. It is described as a peaceful place, with vast fields and hills where our dear friends can play, run and enjoy their innocence. It's a wonderful place with fresh grass, with trees with big hooves, streams where they can dine, with so much food (their favorite!)... and where the sun is always shining and ready to warm our beloved angels. In this magnificent place all the animals that were old or very sick could be healty again and full of energy as they once were. Older pets will be again young and all the bad things happened in life are erased to give way to the happiness of anyone who is there. 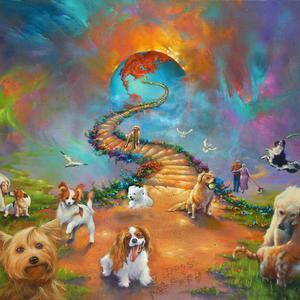 However, unfortunately, there is a discomfort that accompanies all the inhabitants of the Rainbow Bridge: the memory of someone really special that they had to leave on Earth. And when he will finally reache you, you will have a huge hug that will not separate you anymore. Finally your hands will touch again your big friend's head and after a long time you will still be staring at his sweet and sincere eyes.